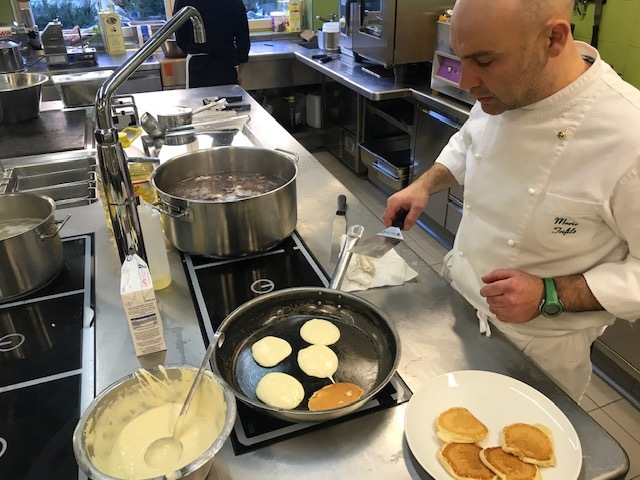 Today we will reveal to you our chef Mario's recipe for pancakes. Be ready to enjoy the traditional "american breakfast" with the delicious pancake, a small delicacy that you can fill in the tastiest and funniest ways. And what about you?! How do you prefer them? The tradition wants it to be garnished with maple syrup or honey, but the possibilities are countless: from fresh and canned fruit to fruit jams, from mixed berries to "Nutella" (chocolate and hazelnut spread), different creams and sauces. Our favourites are with Thun honey! Mix flour, sugar, baking powder, vanilla flavour and salt. Mix the eggs with the yogurt and the melted butter. Put the two mixes together, then add milk and adjust thickness. Cook in a very hot non-stick pan. Tag us in your photos or in your stories. We are curious to know how you prefer your #monrocpancake. We also wait for your pictures during the preparation of the pancakes at home. It will surely be funny!